Pakistan: Friend or Foe in the Fight Against Terrorism? 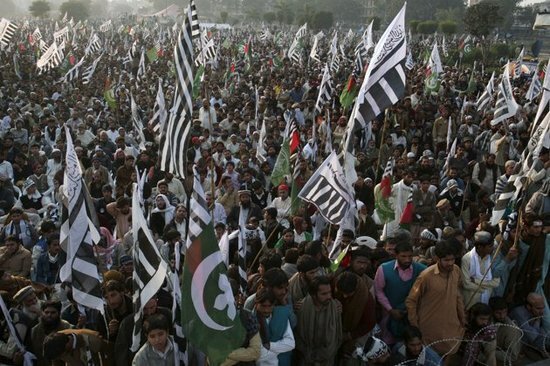 The black-and-white banner of the Jamaat-ud-Dawa, the front group for the Lashkar-e-Taiba, is prevalent at an anti-US rally in Lahore in December 2011. AP photo. Editor’s note: Below is Bill Roggio’s testimony before the House Committee on Foreign Affairs Subcommittee on Terrorism, Nonproliferation, and Trade and the Subcommittee on Asia and the Pacific. A PDF of the testimony, with footnotes, can be downloaded here. Chairman Poe and Chairman Salmon, Ranking Members Keating and Sherman, and other members of the Committee, thank you for inviting me here today to speak about Pakistan and its support for terrorist groups that threaten the security of the United States and its allies. This Committee rightly asks the question of whether Pakistan is a friend or foe in the fight against terrorism. While Pakistani officials and forces have assisted the U.S. in hunting senior al Qaeda figures at times, Pakistan’s overall strategy is pro-jihadist and therefore puts it in the foe category. Pakistan does battle some terrorist groups within its borders, but it only does so because these groups pose a direct threat to the state. Pakistan myopically supports a host of terrorist groups in Pakistan, Afghanistan, and India to further its goals in the region. Pakistan backs these groups despite the fact that they are allied with and aid the very terrorist groups that fight the Pakistani state. In addition, many of the jihadist groups sponsored by Pakistan are allied with al Qaeda. Today I will highlight six major groups directly supported or tolerated by Pakistan’s establishment: the Afghan Taliban and its subgroup, the Haqqani Network; the Mullah Nazir Group, Lashkar-e-Taiba, Harakat-ul-Mujahideen, and Jaish-e-Mohammed. Each of these groups is used by Pakistan as an instrument of its foreign policy. These six groups are by no means the only terrorist organizations supported by Pakistan, they are merely the most prominent. Pakistan uses these six groups and others as a counterweight against what its policy makers perceive to be Pakistan’s greatest threat: India. However, the jihadist ideology has also spread throughout Pakistan as a result of policies adopted by the country’s military elite. Therefore, we should not underestimate the degree to which these groups are supported for ideological reasons. Pakistan, a country of 182 million people, does not possess the manpower to counter India, a nation of 1.25 billion. Pakistan and India have been in a virtual state of war since Partition in 1947. The two countries have fought four active wars in 1947, 1965, 1971, and 1999. Each of these wars was initiated by Pakistan, and ended in defeats. Pakistani strategists have determined that to counter India, it must use unconventional means, including supporting jihadist groups. To compensate for its inability to achieve victory on conventional battlefields against India, Pakistan implemented its own version of “strategic depth” in Afghanistan. Pakistan has supported groups in Afghanistan in order to deny India influence in its backyard, as well as to allow the nation to serve as a fallback in case of an Indian invasion. Pakistan capitalized on the chaos in Afghanistan post-Soviet withdrawal and hunted for a group that would serve its purposes. With the rise of Mullah Omar’s Taliban faction in the early 1990s, Pakistan military and intelligence officers assigned to implement strategic depth saw the perfect partner: a powerful jihadist political movement that was gaining popularity throughout the country and was capable of sustaining military advances. Pakistan provided military and financial support to Omar’s faction, which successfully established the Islamic Emirate of the Taliban in 1996 and controlled upwards of 90 percent of the country until the US invasion in 2001. In addition to securing a friendly government in Afghanistan, Pakistan used the country as both a training and a recruiting ground for a host of jihadist groups that fight in India-occupied Kashmir. In order to justify its policy of support to jihadist groups, Pakistani elites have attempted to distinguish between what are referred to as “good Taliban” and “bad Taliban.” Simply stated, the so-called “good Taliban” are groups that advance Pakistan’s foreign policy goals and do not threaten the state or wage war within its borders. “Good Taliban” and other groups deemed acceptable by the Pakistani establishment include the Afghan Taliban, the Haqqani Network, the Mullah Nazir Group, Lashkar-e-Taiba, Harakat-ul-Mujahideen, and Jaish-e-Mohammed. These groups conduct numerous heinous acts of terrorism in the region, and are directly responsible for the deaths of thousands of American soldiers and civilians, and yet are supported by the Pakistani state. Pakistani officials have denied that it pursues a policy of strategic depth and differentiates between “good and bad Taliban”, or alternatively, have claimed it will no longer differentiate between the two. However, these claims are false. This is demonstrated in Pakistan’s continuing support for the aforementioned groups and others, as well as an unwillingness to round up leaders and key operatives of these groups. Pakistan’s support for the Afghan Taliban is well documented. It helped establish the group in the 1990s and continues to support it to this day. Hamid Gul, the former head of the Inter-Services Intelligence Directorate (ISI), Pakistan’s military intelligence agency that developed and implemented the policy of strategic depth, is known as “the father of the Taliban” for his role in directing support to the Taliban. (Gul is also known as the “Godfather of terrorism” for his support of global jihadist groups.) The term “father of the Taliban” isn’t reserved only for Gul; Maulana Sami ul Haq, the director of the radical Darul Uloom Haqqania madrassa, also hold this title. His madrassa feeds thousands of new recruits to the Taliban on a regular basis. Afghanistan’s insurgency continues to be fueled by Pakistan’s military and intelligence services to this day. The Taliban’s Quetta Shura, or supreme decision making council, has been based in the Pakistani city of the same name as well as elsewhere. The Taliban’s four regional military commands all are named after Pakistani cities (Quetta, Peshawar, Miramshah, Gerdi Jangal). The Taliban’s top leadership has been based inside Pakistan, with the knowledge and approval of the military and ISI. The Taliban’s first two emirs died while in Pakistan. Mullah Omar, the Taliban’s founder and first emir, died in a Pakistani hospital near Quetta in April 2013. His successor, Mullah Mansour, was killed by the US in a drone strike in Baluchistan two months ago. They and other senior, middle and lower level leaders have operated inside Pakistan without consequence. Pakistan’s border areas with Afghanistan serve as the life blood of the Taliban. While all of Pakistan is jihadist friendly, the provinces of Khyber Pakhtunkhwa and Baluchistan are flush with Taliban recruiting centers, training camps, safe houses, and financial hubs. Taliban commanders freely admit that the ISI arms them and provides safe haven and training camps inside Pakistan. Meanwhile, radical madrassas throughout the country indoctrinate Pakistani youth into the jihadist worldview and send them off to fight for the Taliban and other allied groups. The Haqqani Network (HQN) is listed by the US as a Foreign Terrorist Organization for its support of al Qaeda and other terrorist groups. It is an integral part of the Taliban. Its founder, Jalaluddin Haqqani, is a member of the Quetta Shura, while his son is one of the two deputy emirs to Mullah Haibatullah, the new leader of the Taliban. Thirteen senior HQN are listed by the US as specially designated global terrorists; most, including Sirajuddin, have been directly linked to al Qaeda. Several top al Qaeda leaders were killed in US counterterrorism operations while being sheltered by HQN. Deadly HQN attacks inside Afghanistan have been directly traced back to Pakistan. In one instance in 2011, HQN handlers, including Badruddin Haqqani, directed an assault on a hotel in Kabul from Pakistan, according to Afghanistan’s National Directorate of Security. A similar attack took place in Jalalabad that same year. In Pakistan, the HQN is based in North Waziristan and has a presence in other Pakistani tribal agencies, such as Kurram, The Haqqanis run the notorious Manba Ulom madrassa in Miramshah, North Waziristan. Despite the HQN’s overt links to al Qaeda, the group remains a darling of Pakistan’s military and ISI. When the Pakistani military conducts operations in the FATA, it deliberately avoids the HQN. While Pakistani leaders insist the Haqqanis are not excluded from operations, not a single senior, mid-level, or junior leader has been killed or captured during Pakistani operations in the FATA from 2008 to date. The Mullah Nazir Group is a Pakistani Taliban faction that operates in South Waziristan. The US government listed it as a specially designated global terrorist entity in 2013 and said it “has run training camps, dispatched suicide bombers, provided safe haven for al Qaeda fighters, and conducted cross-border operations in Afghanistan against the United States and its allies.” Its current leader, Bahawal Khan, and his deputy, sub-commander Malang, are also listed by the US as specially designated global terrorists. Its former leader, Mullah Nazir, who was killed in a US drone strike, identified himself as a leader of al Qaeda and said he shared the group’s views on global jihad. Multiple al Qaeda leaders have been killed while sheltering with the Mullah Nazir Group. The Pakistani military provided the Mullah Nazir Group with direct support when it clashed with rival members of the Islamic Movement of Uzbekistan. Despite the Mullah Nazir Group’s direct ties to al Qaeda, Pakistan has viewed it as an ally in the tribal areas. Like the Haqqani Network, the Mullah Nazir Group was left untouched when the Pakistani military launched operations that targeted the Movement of the Taliban in Pakistan. Lashkar-e-Taiba (LeT) is perhaps the most blatant example of Pakistan’s support for jihadists groups. Listed by the US as a Foreign Terrorist Organization, it was founded by its leader, Hafiz Saeed, along with Osama bin Laden and Abdullah Azzam, the godfather of international jihad. Bin Laden helped LeT establish training camps in Afghanistan’s provinces of Kunar and Paktia, where it continues to operates to this day. LeT shares al Qaeda’s goal of establishing an Islamic state in South Asia and beyond. LeT operates openly inside Pakistan and has offices throughout the country. Markaz-e-Taiba, its headquarters in Muridke near Lahore, is a sprawling complex that is used to indoctrinate future jihadists before they are sent off for military training. The provincial government of Punjab has financed Markaz-e-Taiba in the past. This terrorist infrastructure was used to conduct egregious terrorist attacks in India and Afghanistan. The most prominent attack took place in Mumbai, India, when a suicide assault team fanned out across the city and targeted multiple locations, including a theater, a train station, hotels and a Jewish center and killed 164 people. The attack lasted for three days. Indian intelligence traced phone calls back to handlers in Pakistan as the assault was ongoing. The handlers directed its fighters to execute non-Muslims, often brutally, and laughed when their instructions were carried out. After the attack, Interpol issued arrest warrants for two serving senior Pakistani army officers and a retired major. Despite LeT’s overt ties to al Qaeda and its campaign of terror in India and Afghanistan, the Pakistani government refuses to crack down on this group. Its complexes in Muridke and throughout the country remain open, and its leaders operate unfettered. Hafiz Saeed is feted by Pakistani officials, who refuse to hold him and other LeT leaders accountable for their actions. Not a single member of LeT who has been implicated in the Mumbai attack has been prosecuted. Harakat-ul-Mujahideen is yet another Pakistan-based jihadist group that has been listed by the US as a Foreign Terrorist Organization. Its emir, Fazle-ur-Rahman Khalil, is also named by the US as a specially designated global terrorist. In an update to the US designation of HuM in 2014, the US noted that it “operates in Pakistan, and engages in terrorist activity in Kashmir, India, Pakistan, and Afghanistan” and “also operates terrorist training camps in eastern Afghanistan.” These camps are thought to be in existence to this day. Khalil, like LeT’s Saeed, is a made man inside Pakistan. In 2011, it was reported that he lived openly near the capital of Islamabad. Khalil is one of the jihadists Osama bin Laden consulted before issuing his infamous fatwa declaring war against the US in 1998. Khalil also signed the fatwa. Osama bin Laden’s courier was reportedly tied to HuM, which may have played a role in the al Qaeda master’s support network inside Pakistan. HuM has also acted like a feeder organization for al Qaeda’s newest regional branch, Al Qaeda in the Indian Subcontinent (AQIS), which was officially established in September 2014. Asim Umar, the emir of AQIS, is a former member of HuM. And like LeT, Pakistan has done nothing to crack down on HuM and its activities in Afghanistan and Kashmir. The US government has listed Jaish-e-Mohammed (JeM) as a Foreign Terrorist organization and its leader, Massod Azhar, as a specially designated global terrorist for their ties to al Qaeda and other jihadist groups. JeM was implicated along with the Lashkar-e-Taiba as being behind the Dec. 13, 2001 attack on the Indian Parliament building in New Delhi. Sheikh Ahmed Saeed Omar, a close associate of Azhar, was behind the kidnapping of Wall Street Journal reporter Daniel Pearl. Pearl was later beheaded. Most recently, Indian officials implicated JeM in the January 2016 assault on an Pathankot Air Force Base in India. Like other attacks, Indian intelligence intercepted phone call of Pakistan-based handlers directing the assault team as they attacked the base. Despite JeM’s terrorist activities, Pakistan has not taken action against the group. India has made repeated requests for extradition of Azhar, only to be ignored. Pakistan’s intransigence towards jihadist groups has not escaped the attention of the US government. In its Country Reports on Terrorism 2015, the State Department issued a scathing rebuke of Pakistan’s failure to police jihadist groups in the region. “Pakistan did not take substantial action against the Afghan Taliban or HQN, or substantially limit their ability to threaten US interests in Afghanistan,” the report noted. “Pakistan has also not taken sufficient action against other externally-focused groups such as Lashkar-e-Taiba (LeT) and Jaish-e-Mohammad (JeM), which continued to operate, train, organize, and fundraise in Pakistan,” State continued. Additionally, State noted that groups continue to fundraise without consequence and Hafiz Saeed “was able to make frequent public appearances in support of the organization’s objectives,” without Pakistan raising a finger to stop him. State did not explain why Pakistan refuses to crack down on terrorist groups in its midst, but it is clear that the military and government considers jihadist organizations as a strategic asset and some see the jihadists as their ideological brethren. Wow…. You are good my man. You should be the real terrorist expert that works for Think Tank. Thank you for your continued efforts in this struggle. And now there is connection coming out between Pakistan based JuD, Hafeez Saeed and recent blasts in Saudi, which signals a new chapter in terrorism spread from Pakistan and a dangerous turn of events. That article is one of the best ever written on the subject of terrorism and its network of supporters one being elements within Pakistan society. Surely China and North -Korea have some responsibility for supplying arms which end up in those terror networks through Pakistan used in killing civilians. Wonder how long it will take before the Taliban is running Afghanistan and the Pakistan leadership with the aid of a ISIS regime? Secondly, what’s your thoughts on ISIS growing supporters in India, Malaysia, Southern Thailand and Indonesia will it established stronger recruitment in the next few years? The only thing missing from the article is the Islamic State. Yes they are predominantly in the Nangargar region of Afghanistan, but they have claimed attacks against the Pakistani consulate in Jalalabad and have even attacked a bus load of Shias in Karachi in Pakistan last year. I can see in the not so distance future, the islamic state attacking more inside of Pakistan, with the result of them even attacking the Pakistani sponsored islamic terrorist groups like Lashkar-e-Toiba and others !! Pakistan did an end-run around the global non-proliferation regime leading to secret tests and rampant proliferation making themselves permanent pariahs. This exacerbated their terrorist tendencies and made their relations with Washington almost always charged with this “original sin.” Being such liars, and well practiced from lying about nuclear activities, the Pakistanis just dug themselves in deeper by letting Saudi Arabia zombify their poor and stoke the terror fires by funding of mullahs and madrassas. Until America starts calling out the Kingdom, Pakistan will always feel it has a rich uncle (not Sammy). Kashmir is a disputed territory. And I see no mention of the dozens of Kashmiri civilians killed by occupying Indian forces and the large support of Kashmiris for HuM. You can’t deny people their rights for ever. No, you have it the wrong way around. Pakistan inherited Pashtun lands conquered and occupied by the British during their imperial rule. Those conquered Pashtun lands remained in open rebellion against the British, and never recognized Islamabad’s authority after Pakistan became independent. The unconquered Pashtun lands, which had formed the Pashtun-majority nation of Afghanistan, continued to clamor for the release of the conquered Pashtun lands wrested away from them. Pakistan thus had to contrive a strategy of promoting jihadism against both India and Afghanistan. The artificial Durand Line, so-called “border” between Pakistan and Afghanistan which artificially splits the Pashtuns on both sides of it, is the ultimate root cause behind Pakistan’s behavior. Pakistan is thus trapped in irredentism. US does not have a coherent policy. While US multi nationals do business in china , pentagon games Chinese threat. While coalition troops die in attacks by Taliban, US Government hobnobs with Pakistani government.One of the forums i came across an US gentleman says Pakistan is a friend and we can’t cutoff relations. While Russia did not fight with US or kill US soldiers but declare it as an enemy. But here Pakistani sponsored networks kill US soldiers, and still US government offers aid. What a joke and what kind of jokers are ruling in US. What kind of think tanks US have? Do they take integrated approach or they analyse selectively? 1)What kind of strategic gains US want to gain by hobnobbing with Pakistan? 2)US wants to have foothold in South Asia or in a region boarders with Iran and China. By being friendly with Pakistan what did US achieve? 3) How many billions US spent in Pakistan for the fighting in Afghanistan? The same amount had US spent on Tajikistan or Russia , the results would have been different? 4) US spent billions for killing osama. instead had they bombed Pakistan one tenth of that price US would have solved the problem. Why US think tanks are not using deep learning algorithms to get solution? Kashmir is the flash point. if Kashmir issue is not solved, it will have much more bloodshed in south asia. Afghanistan will have peace once Kashmir is solved. Please read history and you will find why Pakistan behaves in this manner. I quote this information from Pakistani official web site. We will lot more destruction by Pakistan and its arsenal in coming years. Pakistan is just waiting to hit at heart of humanity. We as American’s will see true feelings of Pakistan the day no more money is sent to Pakistan. I hope we wake up before it is too late. A nice overview of Pakistan’s sponsorship of terrorism in the region; but it is nothing that US policy makers have not known for many years now, and nothing has changed. The reason is because the US plays the same game of good terrorists and bad terrorists in its policies, with Pakistan and Saudi Arabia and the Gulf States as “good” and Iran and Syria and Yemen as “bad”. To paraphrase Bill, it is clear that the (US) military and government considers (its) jihadist states (like Pakistan) as a strategic asset. The only saving grace might be that no one here see these state sponsors of terrorism as their ideological brethren; although there has been a long incestuous relationship between the US military and government and the rulers of these terrorist states, which includes the Pakistani military. Excellent comment; particularly liked the last sentence. We need to get out of bed with snakes, Saudi and/or Pakistani. It’s just healthier and cleaner that way. Our geopolitical interests should not trump morality! Excellent truthful analysis save the fact that there was a direct US funding and Saudi ideological support to jihadist against Soviet Russia which later formed these groups and ISI. The full truth is important because the war against terrorism cannot be won unless United States accepts its own wrongdoing and makes a new beginning. It needs to support the same liberal progressive nationalism in Muslims Countries which it crushed via the wahabi mullah and its ex colonial Armies. You can’t fight an ideology with bullets you need a counter ideology. American should support the end of feudalism in Pakistan and use the political capital earned to fight its own funded Islamic Extremism. The army is divided and still has progressive nationalists in its folds to work with. But again it was a good analysis. Pakistan, like Turkey has been playing both sides and we are suckers. They have no interest in cracking down and Britain and Canada welcome the Pakistanis with open arms. It is time to get serious. They are on the side of Iran, Eritrea, Syria and Pakistan. They made this smelly stew, now it is time for them to suffer in the stink they have created. For far too long the world has looked away from Pakistan hoping the problem will go away if they ignore it long enough. But what people don’t realize is it is the military that rules Pakistan and the civilian govt. is just a front. So if Pakistan becomes a peaceful country, the military loses power, relevance and the civilian govt becomes more powerful. So Pakistan military, for their own survival, will never let Pakistan become a peaceful country. So the military creates terrorists, take funds from the US, uses the funds to buy planes and tanks and missiles to use against India and kills a few terrorists to show ‘progress’ to the US and the the cycle continues. People are too uneducated to do anything about this and they are taught by propaganda that India, US, Israel and the rest of the world, except China, is against them and it is the military that is their savior. China sees Pak as a balancing power against India and the US so China uses Pak to counter India and keeps the flame alive. No one in the world has an answer but the least the world can do is to stop funding this madness! Christ’s Infidel Army knows a different way to fete him… just get in the open. Walk the dog or something. You are right on the money. Continue the good work. Please see the YouTube videos by various Pak TV stations and see the venom they spout against the US, India and Israel day after day. Pak society will never introspect. In fact their belief is that they have bee ordained by Allah to conquer India and Israel. Need this madness to stop. Well done Bill. After all these years, one would have thought much of this testimony would be well known especially to our elected officials. Sadly, it is not. Even Pakistani emigres seem to not be aware of what all is going on in the region. The national news does not find these things to be of interest even though we are at war there and have been for 15 years. Ever heard of Al-faran and 1995 kidnapping and beheading of Americans in Kashmir? I guess not. How about Maulana masood azar? May be some of you might remember Daniel pearl. From the late 1980’s and continuing through the 1990’s GOI were screaming themselves hoarse about the complicity of the state of Pakistan and its military institutions in fomenting and nurturing international terrorists activities within the region of south-asia and beyond. Where were you during those time, Bill? Now after 30 or so years we are asking the question if, Pakistan: a friend or a foe? It took 9/11 to open the eyes of the west to the dangers residing/arising from within the Af-pak region. Now pakistani govt wants to include an artificial entity (proxy of pakistani military)called “taliban” to be included within the Afghan govt. The prevailing myth si that Taliban rose out of Pashtoon nationalism. I spoke to several Afghans both Pashtoon and from the north who mentioned that there were no Taliban in Afghanistan before the 1990’s. Pakistani army has to be defeated/exposed if the American govt wants to eliminate Taliban and bring peace to Afghanistan. Are we ready for that?